of the perfect campsite. But wherever our summer adventure took us, my parents always had to stop at souvenir shops to pick up mementos of our sentimental jour- neys. My dad collected a keychain from every destination, while my sis- ters were drawn to ceramic animals. For me, I couldn't resist any type of box that I could fill with my collections of curiosities and found objects. My attraction to boxes, cases and containers of all types were to pre- serve expressions of what was important to me in different stages of my youth, as a time capsule of my imagination. 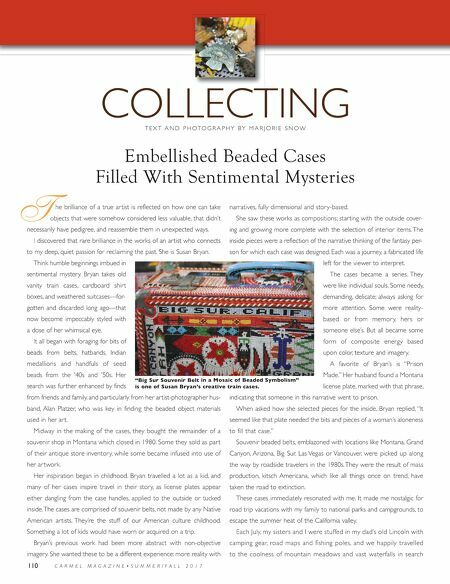 Bryan has found this pulse and connection to our past through her exquisitely embellished beaded cases filled with sentimental mysteries from another decade. They are a deconstruction of childhood memories, mixed with a splash of smile-inducing baubles, while containing elements of an incomplete story. It takes three to six months to complete a case. They are collector's pieces and are shown exclusively at Patina Decor in Las Vegas and priced from $1,250-$2,500. But catch her while you can, as there are only 17 cases ever made. Marjorie Snow is a writer and photographer with a vast knowledge of antiques and their history. Snow was the owner of Terra Cotta in Las Vegas, an exclusive architectural vintage gallery, which was featured in numerous West Coast magazines. 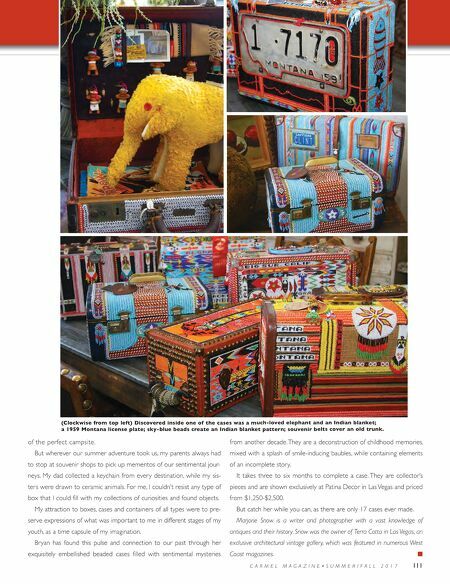 C A R M E L M A G A Z I N E • S U M M E R / F A L L 2 0 1 7 111 (Clockwise from top left) Discovered inside one of the cases was a much-loved elephant and an Indian blanket; a 1959 Montana license plate; sky-blue beads create an Indian blanket pattern; souvenir belts cover an old trunk.